I’ve been calling out transparent BS since before I could talk. I know it when I see it. The so-called game of "peek-a-boo"? A dirty lie. I preferred "Battleship." Still do. My sensors were flaring last week when I accidentally clicked on a link to the left-wing New Republic website, after mistaking it for one of my favorite middle-of-the-road blogs, freerepublic.com. Something didn’t sit right. Obviously, the content was atrocious. But then I looked at some of the bylines. We’re not just going to pretend these are real names, are we? I know this might sound silly coming from someone who works with a "Sonny Bunch," but even though we’ve never met, my associates at Academi have looked into it and assured me that he does exist, beard and all. All but four of these are actual New Republic bylines. I won’t tell you which four, because what difference, at this point, does it make? I think we all know what’s really going on here. 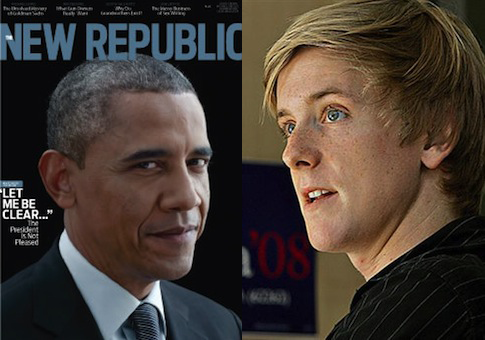 After losing most of his staff, TNR editor-in-chief Chris Hughes has enlisted his husband, Sean Eldridge, to provide most of the failed magazine’s content. Eldridge has plenty of time on his hands after his utterly humiliating defeat in a New York congressional race. Letting Eldridge choose an array of vanity pseudonyms is a way to fill his life with purpose. Biff out. This entry was posted in Politics and tagged Chris Hughes, Parody, Satire, Sean Eldridge, The New Republic. Bookmark the permalink.